kite. Pale clouds float overhead. 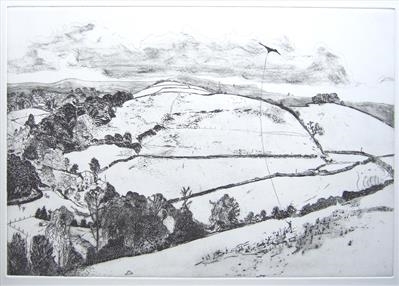 This is one of Susan's earlier landscape etchings showing a lone kite-flying boy, her son, against the dramatic hills and fields of the South Hams. Apart from a long pale cloud, the sky is clear and all the details of the landscape are easily read by the viewer. 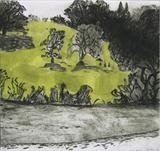 Dartmoor is visible in the far distance, whilst houses peek around the bend of the valley, suggesting the nearby village of Harbertonford, where the artist lives and works. Drawn and etched into copper plate and printed on white Somerset 300gm paper in black ink, this is one of the last few remaining in the edition of twenty.